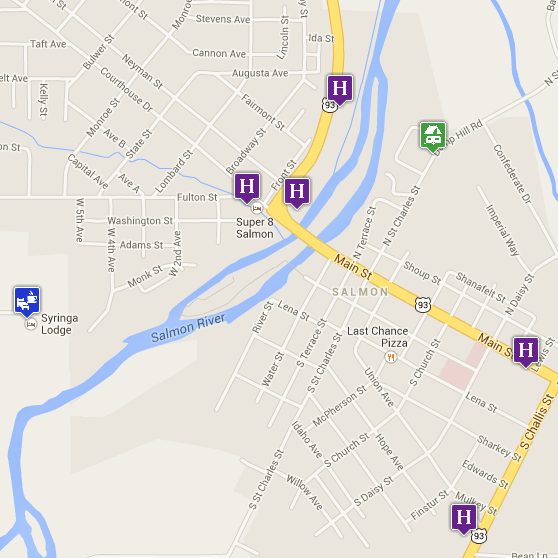 Hotels and Motels in the Salmon, Idaho area. Bed and Breakfasts in the Salmon, Idaho area. RV and camping opportunities in the Salmon, Idaho area. Directions: Out of Salmon, go north on Hwy 93 for 21 miles, to North Fork. Turn Left onto the Salmon River Road, go about 27 miles. Dirt road, plan for slow driving. Directions: 3.2 miles north of Salmon on Hwy. 93, turn left(west) on Diamond Creek Rd. and go 1.5 mi. Directions: 5 miles South of Salmon on Hwy. 93, on the right (west). See something missing from this site, or want to make a comment or suggestion? Fill out our contact form.